Rambo wrote: What happened to the guys that were originally working on your car Clemo ? Did you kick them into touch ? I think my above statement may have been slightly misleading. My car is still at the same place. They have since taken on Nigel as a member of staff. As luck would have it for me ! Apparently he is boring all the rest of the guys to death with stories about the M100. I am going to speak with him tomorrow about a new hood fitting. I think he worked down at Steve Williams down sarf until he recently relocated to the up that there north. Yep was thinking that . Will give them a full rating when i pick my car up. Any ideas on which hood to choose ? 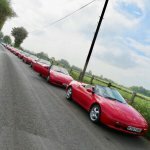 Elan due to be MOT'd today / tomorrow . All the worries of a nut and bolt rebuild now on my mind. Did they put all the shims back correctly when the suspension came off? After a gearbox rebuild will the gear linkage feel smooth ? Will the turbo have seized up having been sat for so long? Is my maiden journey to be from Stafford to Torquay ... or even Torquay to Castle Combe ...what could that throw up ? After all this wait is my car going to be everything i hope it will be . And after all this wait it will still look like a project car when it turns up to Castle Combe !. This is a worry for sure. Maybe i should take it for a quick run up to JamieN's house ... meet you there Mark? Thank you Chris . Wish i could do a local shakedown but the car is 300 odd miles away . should know it quite well after that run though. I’m in a similar situation. I finally refitted the instrument panel today after the alarm retrofit which has taken me several months. And tomorrow I’m going to start the car for the first time in that period Then all being well, it’s MoT next week. And all being well with that, I’ll see you at CC in three weeks time! Up and running teething problems . Fuel pump continues running anddelivering to much pressure to the fuel rail = lumpy running . upon further investigations the inertia with has been hard wired out from a yellow 10amp fuse in the footwell all the way up to the inertia switch and down to the fuel pump with some kind of cut in. Not sure why or to what effect it is bypassed. Anyway the morning of MOT my garage decided to put fresh fuel in to alleviate the problem ... it didn't . Car was working on a test drive a year ago but since then everything has been moved , replaced , fiddled with. Back to the what we know. A 12 Amp feed via a relay via the inertia via the fuel pump is causing a non shut off of the solenoid on the end of the fuel rail ? maybe a vacuum issue ? . Anyway after much taking to diagnostic Dr Pink and the garage brings some solutions . Mr X who once worked for lotus in on it . Though this is a good thing it can also cloud the issue . These cars a now old . and some has bypassed it for a reason . I fully respect his knowledge of it is "not right' but it is functional .Is the bypass of the inertia switch the same issue as the lumpy running .... not sure . 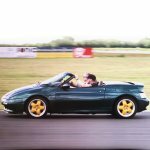 It matters not , as after leaving mr ex Lotus to play he had removed all the extra wiring , got the inertia switch to work ( which really bothered him from a safety point of view) and the lumpiness has gone. Along the way he put the lumpiness down to a defective spliced in relay . So now all is good . His initial though was the wire was circumnavigating the ECU ... whilst I'm not to sure about that the over fuelling / pressure issue has gone and the wiring is back as it should be . lets see how this shakes down. Glad to hear things are progressing, Clemo. FWIW, my rule of thumb with unidentifiable wiring is that it was put there in the distant past in connection with a long-defunct immobiliser/alarm by a DIY mechanic three owners ago who is now untraceable. Naturally, he/she didn’t document the work or use standard wiring colours. Of course, none of us has ever done that . . . I too am scheduling an MoT next week, so we may even see each other, in our Elans, at CC. The inertia switch only directs power to the fuel pump during normal running or CDL in the case of an accident. No connection to the ECU, so I agree with Nigel about a dicky relay and/or connections as the fuse is rated 7.5A and the pump is likely to demand more than that transiently. Also agree with him about safety - the inertia switch is there for a very good reason and should work as intended! GeoffSmith wrote: The inertia switch only directs power to the fuel pump during normal running or CDL in the case of an accident. No connection to the ECU, so I agree with Nigel about a dicky relay and/or connections as the fuse is rated 7.5A and the pump is likely to demand more than that transiently. Also agree with him about safety - the inertia switch is there for a very good reason and should work as intended! As I didn't think Lotus would sail that close to the wind it was a good excuse to play with my new toy recommended by Peteoddcar ...Automotive-Current-Tester-Circuit-Meter-Standard-ATO-ATC-Blade-Fuse-Car-Vehicle Max I saw was 4.2 amps. Suppose it might be a bit higher if the fuel filter hadn't been changed recently but seems the 7.5A fuse has a bit in hand. Passed . no advisories ... i should blinking hope not too. Brake efficiency 100% after rebuild. i did ask if it was infact my car he tested ! he said yes and same went for emissions . Look forward to seeing the data sheet on that. I'm not surprised you're reading 4.2A on a DC meter Phil, but having spent a fair bit of time in my previous existence looking at hybrid gold and aluminium bond wire burn out… the important thing is I²t for very short duration transients such as might be demanded by a pump motor. If the relay impedance was significant, then the motor may well play up as current spikes collapse the applied voltage. clemo wrote: Brake efficiency 100% after rebuild. PS Congratulations -you're legal. When will we see see you somewhere north of Castle Combe? Free B&B at my place. GeoffSmith wrote: … the important thing is I²t for very short duration transients such as might be demanded by a pump motor. If the relay impedance was significant, then the motor may well play up as current spikes collapse the applied voltage. Yeah... tell us something we don't know. Actually i have no idea what they are talking about . *= subject to not having any mechanical or electrical issues on my maiden voyage. ...blah blah blah...numbers..... blah blah blah.... scientific stuff no-one else understands.... blah blah.